Tuesday, July 31. Let's all pause for a moment and wonder together where the summer is going so fast. Ridiculous, right? Completely. But the end of yet another month isn't necessarily cause for total dismay, at least not in these parts, for the end of the month is that time when bloggers across the Internet reveal Foodie Pen Pal goods. Are you a Foodie Pen Pal? You should be, even if you aren't a blogger. It's so fun! You get to give and receive awesome foods, you're guaranteed at least one cool delivery in your mailbox per month, and you get to connect with someone new. But that's not all. 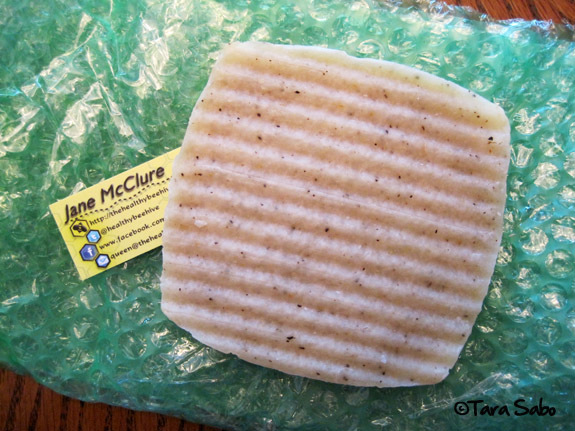 She included this chunk of homemade soap, too. And it smells so, so good. I had to put it in the 'fridge upon receipt because it was, well...sort of a peanut butter cup soup, what with the heat it encountered during transport. Still good, regardless, as are most of Justin's products. I threw the packet of honey almond butter in the diaper bag with an apple before heading out to work on Monday. I ended up dropping the apple after a few bites...no, literally, I dropped it on the floor of my car. But I ate the rest of the almond butter anyway. I love that stuff too much to let it go to waste. In fact, I loved everything she sent me, but my favorite might have been the tablet of Mad Libs. How long has it been since I've done any Mad Libs? I can't even tell you. The writer in me is a huge fan! My favorite part? "The marathon, a 13-mile race..." If only. Thanks for all the awesome goodies, Jane! If you guys want to see what I sent my Pen Pal, visit Carly at Soak and Simmer. And if you wanna win an ICEdot bracelet, CLICK HERE for the details—it's the last day to get your entry in! I broke out the medicine balls in my Circuit Sculpt class this morning. I haven't been using them at all...typical, really. I tend to use the heck out of stuff, then forget about it all for a few weeks before breaking said stuff out again. Such was the case with the medicine balls. What about you? Do you use them on a regular basis? 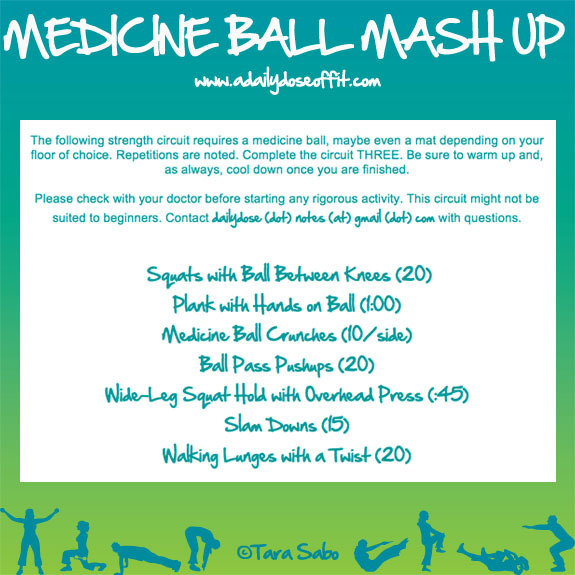 Regardless, I thought it would be fun to piece together a medicine ball workout for you. Mind you, the balls we use in class are 4 kilograms, which equates to a little over 8 pounds. You don't need a heavy ball to make it count, though you can certainly use one if you'd like. Please note that the following assumes you've warmed up for at least ten minutes, and it also assumes you're A-OK to hit the gym. If there's any question, please consult your physician. Otherwise known as leg extension crunches. Start in pushup position with the medicine ball under your right hand. Perform one pushup, then pass the ball to your left hand without breaking form. Repeat until you've completed all of the prescribed repetitions. Yes, it's exactly as it sounds. As you hold the medicine ball over your head, press your hands into it throughout your squat hold to activate your upper body. Don't just hold it...press it. Remember to twist over the leg that's in front. Need further help? Let me know: dailydose (dot) notes (at) gmail (dot) com. In other news, I had a fantastic smoothie today. 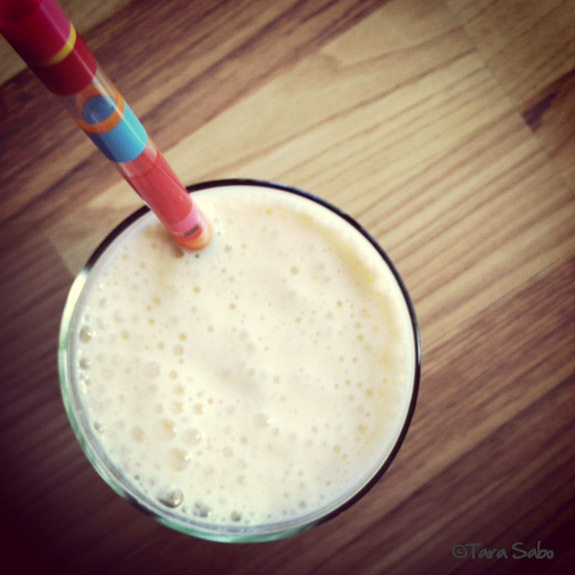 Mix one serving of Chobani's Peach Greek Yogurt with half a banana, two apricots, a cup of milk and four ice cubes. Yes, four. I'm convinced it's the right amount as this number of cubes has never done me wrong. Question: What's your go-to smoothie? Every month, Marie Claire prints a column that highlights a select group of individuals and their favorite beauty products. They call it "Beauty Passport" as these people and products come from around the world. This month's issue featured fitness professionals like Tanya Becker of Physique 57 and Elizabeth Cutler of SoulCycle. While I love reading the column, I can't always find the products. And let's be honest, sometimes the products I can find are just too dang expensive. ($48 sunscreen? No thanks.) So I thought it would be fun to put together a post of MY favorite beauty products—because I'm a fitness professional, too! And I promise you, all of them are affordable and can be easily found. I hate foundation, so I go for the tinted moisturizers. MAC Studio Moisture Tint is my favorite, hands down, but I've been experimenting with Garnier BB Cream with acceptable results. It's much cheaper, and I can buy it at the drugstore versus driving into South Bend (where the closest MAC counter is). I also slap on a little MAC Studio Sculpt Concealer beneath the eyes—it's totally waterproof, which also translates to being sweat proof. The finishing touch? Cover Girl Lash Blast Volume Waterproof Mascara. If I could only live with one bit of makeup, it would be my mascara. Love making my lashes pop. I feel like it wakes me up. Speaking of waking up. I never start my day without some fresh deodorant. A fitness professional cannot be without her deodorant. Could you imagine? "Here, let me spot you...sorry my pits stink." Gross. I was recently given the Dove sticks to sample, and have been liking them just fine, but my all-time favorite is Secret Invisible Solid Antiperspirant and Deodorant. It doesn't have a pungent odor, and doesn't leave white marks on my shirt. Seriously, I've been using it for years. Tip: Be careful when you pick out deodorant. It might smell good on the shelf, but when you mix it with your sweat during a workout...let's just say that it might not smell as good. That's why I always stick with "Powder Fresh" scents. And it's probably my biggest beef with the Clinical Protection stick above. I like how it smells, but for some reason, I don't like how it smells when I put it to use. Let's talk about hair. Mine doesn't meet the blow dryer that often these days, but it does take a beating. As a fitness pro, I pull it back into a ponytail almost every single day. Sometimes I loop it into a bun. And because it's longish, I'm vastly familiar with detangling knots which are typically drenched in sweat. Bottom line...I can't live without my Aveeno Nourish + Moisturize Shampoo and Conditioner. Or my Aveeno Positively Radiant Skin Brightening Daily Scrub. Seriously, I've tried other brands in both categories. NOT THE SAME. I always go back to Aveeno. Even when it comes to sunscreen, shaving cream and regular 'ol face lotion. I'd show you my face lotion, but I'm trying to work through a bottle of something else that is decidedly not one of my favorites. My hands take quite the beating at the gym. Aveda Hand Relief and Sally Hansen Vitamin E Moisturizing Nail Cuticle Oil work together (and separately) to wipe all of it away. Yep, baby wipes. I keep these with me for obvious reasons (to wipe my baby's bum), but they also come in handy when I'm sweaty and gross. If I can't go home right away for some reason or another, a few swipes of a wipe make me feel a bit better about myself. And if you don't have a baby, you can often find all-purpose towelettes like the above at Target in the travel-size section. I love the travel-size section. Question: What are some of your favorite beauty products. Guys, I know you've got 'em, too. Please note that I purchased the above with my own money, except for the Dove products which were given to me a few months ago for a sponsored post. See included link for details. All opinions are my own, and yes...I really do use and purchase these products. ...but that doesn't mean I can't dream about what it would be like to stand on that podium. Any podium, really. I did gymnastics when I was little. Grade school, during my seventh and eighth years. And I was actually a part of a competitive team. I sucked it up on the balance beam, vault and uneven bars. But on the floor, well...I loved me some floor exercise. I never scored a perfect 10, but I did win a few blue ribbons in my time. Even some "gold" medals, which are now all tucked away in a box at my parents' house. What I'll ever do with them, I have no idea. Maybe I'll pull them out when Hannah gets older and let her play pretend with them. Not tucked away—my love for the sport. And the Olympics. Question: What Olympic events do you enjoy the most? Anything you're looking forward to watching? Aside from the gymnastics, I'm anxious to see how Michael Phelps does in the pool...seems like he's got a hottie on his heels this year. And then there's Oscar Pistorius the sprinter from South Africa with synthetic legs. Words can't even describe his ability to inspire. For the past few weeks, I've been teaching a Foam Roller class on Thursday mornings. I did some continuing education on the subject, and have used the roller both on myself and with my clients, but I find that teaching this class is a challenge, albeit one I'm willing to accept. The previous instructor was a massage therapist—much more proficient in foam rolling than I might ever be as it is a form of self-massage. And while she approached the class from a very self-massage point of view, I come at it in terms of self-massage AND static stretching. Sometimes even core work. And while I enjoy teaching the class, as I said before, I do find that it's a challenge to teach. 1) It's hard to watch everyone while maintaining a proper roll. 2) It's hard to set the roller aside to watch everyone as my people like to follow along. 3) It's hard to fill an entire hour with foam rolling. Question: What's your experience with the foam roller? Do you enjoy it? Have a favorite move? Whenever I leave for a run, my husband tells me to be safe. Safety, of course, is my number one priority. I don't run on crazy roads or in shady neighborhoods. Or when it's dark out. I play my music at a lower volume, and I keep an eye out for creepy people. All of which you, male or female, should be doing as well. But these actions don't necessarily make me (or you) immune to trouble. Things happen, freakishly so. But knock on wood—they haven't happened to me yet. However, there is one thing I'm not good at in terms of safety—carrying identification. I hate being bogged down by excessive...stuff...when I'm running. This, of course, would prove to be a problem should something actually happen to me. That's why I like my Road ID, and it's also why I like my new ICEdot bracelet. Much like a Livestrong bracelet, this lightweight silicone bracelet slips over just about any wrist with ease. Of that I'm sure. Why is this a good thing? On every bracelet is a unique 8-digit number that any first responder can text to the phone number that's also on the bracelet. This 8-digit number is the key to your identity, important health information and emergency contacts. Information you might not be capable of providing if you were seriously injured. And it's so easy to set up on the official ICEdot website. It took me five minutes. I'm not even joking. There are also two different levels of membership into the ICEdot database. Free, which includes your profile and a glovebox form. Or there's the Premium membership, which also includes emergency contact notification, wearable tags, a starter kit and more for just $10 a year. Whichever way you go, you're still covered. And one of you can be covered for free, thanks to ICEdot and Daily Dose. I have an extra ICEdot bracelet, complete with a Free membership, that's ready to ship out to one lucky Daily Dose reader. All you have to do is leave a comment below—I want to know your #1 rule of safety when you're out running (or biking or swimming...or whatever it is you do). I'll pick one person at random after midnight on Tuesday, July 31, 2012. The winner will be announced on Wednesday, August 1, 2012. For more information, feel free to follow ICEdot on Twitter or Facebook. Note: Doing so does not get you additional entries. Disclaimer: The ICEdot bracelet above was sent to me free of charge and without payment for writing this review. All opinions are my own. This month's theme for What I Ate Wednesday is so great. I can't believe I haven't participated yet. Fun, food and fitness. I know, right? Let's focus on the "food" and "fitness" aspects, as I thin both of them are equally fun. And important. Let's face it—what's one without the other? An incomplete adventure in the world of healthy living, that's what. Food and fitness go together like Sandy and Danny. Any "Grease" fans out there? Why do food and fitness go together? Well...why does a car need gas? Without it, the car won't run. So without food our bodies won't move, shake and groove their way through life. When you add a certain level of physical activity to your daily routine, it becomes necessary to choose the right foods because it's form those foods that you'll find the energy you need to exist beyond couch potato status. So essentially, what you choose will ultimately make or break your fitness. Healthy foods support basic bodily functions. Healthy foods fuel muscles to perform beyond the norm. Healthy foods help keep body fat percentages in check. But really, when it comes to healthy foods, there's only one reason why they're so important. HEALTHY FOODS TASTE DAMN GOOD! It's true. I swear (literally and figuratively, as proven above). I've been getting so many great things in my farm share that I've taken to making dump salads, which means that I grab all the produce out of my 'fridge and dump whatever I want into a bowl for lunch. It's a countertop salad bar, if you will. And so yesterday, everything I went for was either blue, green or purple. "Fried" egg on a slice of wheat toast with Provolone cheese and some mashed up avocado. Best sandwich ever. Baked chicken on wheat toast with a slice of Provolone and some Sweet Baby Ray's sauce, with a side of garlic kale chips and a sweet potato. Nom, nom, nom! Gone in a flash. A few hours later, I finally snuck in my workout. Monday morning, I teach Circuit Sculpt and on Tuesdays, I like to follow that with some running. 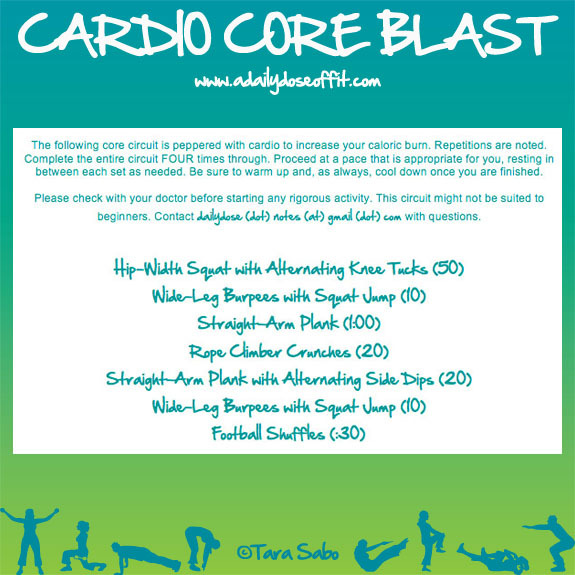 But the temps were against me so I opted to do my Cardio Core Blast workout from last week. Question: Do you eat the same stuff from week to week? What are some of your go-to meals and how do you get out of a meal planning rut? Well...that was a weekend. So on Friday, I came down with a silly bug of sorts that rendered me completely exhausted until Sunday morning. I had a fever, chills, nonexistent appetite...I took two naps on Friday. TWO NAPS, people! One while Hannah slept, and the other after the hubs got home from work. So it was a low-key weekend, that's for sure. I didn't go for my usual Saturday morning peaceful run, although I did go grocery shopping (which was a mistake as it completely wiped me out). I spent most of Saturday without the fever and chills, but the appetite was still somewhat nonexistent. So I munched on carbs. Carbs sounded good. And I drank water. Maybe I was just dehydrated? If you're a personal trainer, take the time to remind your clients to drink enough water. If you're not a personal trainer, take the time to drink enough water! And remind your friends to, too. As I said before, I felt much better on Sunday morning. Still a little off, but nothing at all like I was on Friday. I managed to get myself out to the art fair that was going on in my little beach town. And I ate a fabulous turkey burger for dinner complete with a side of herbed, grilled redskin potatoes. Proof that I was feeling better, that's for sure. And today, I woke up with the sun to teach my 6:00 AM Circuit Sculpt class. With up to 13 people depending on me, I really can't miss it. Nor do I want to. And now, I'm off to catch up on all the things I didn't get done over the weekend. It's Friday. You're exhausted. Just me? Didn't think so. The weekly grind takes it's toll, no? Yes, but it doesn't have to stop you from getting in one last workout before the weekend. Assuming you take weekends off. And if you don't, well...consider this a no-brainer type of workout. The kind were you can get through it in a jiffy with barely a thought, save for those dedicated to proper form and determination. Just to be clear, you can do this on any day of the week. Please do so at your own risk—you'll want to check in with your physician if there's any question as to whether or not you should be doing this. As you come out of the squat, press onto your toes to engage your calf muscles. On your back, keep one leg bent with your heel on the floor as you extend the other up toward the ceiling. Dig the heel into the ground, lifting your hips up while contracting your glutes and hamstrings. Repeat, then switch to the other side. As always, contact me with questions: dailydose (dot) notes (at) gmail (dot) com. Sounds confusing, I know. Here's how it works: Start with your feet together, pop out to a wide squat. Pop your feet back in, then pop into a right lunge. Pop back in, then back out again to a wide squat. Pop back in, then back out to a left lunge. I swear it's not complicated. You'll need a band with handles and a bench for this one. Anchor the band around the base of the bench, hook your toes in the handles and lie flat on the bench. Extend your feet up toward the ceiling to straighten your legs. Feel it in your quads? Good. Repeat. Grab a big exercise ball, lie down and dig your heels into the top of it. Press your hips up and hold. 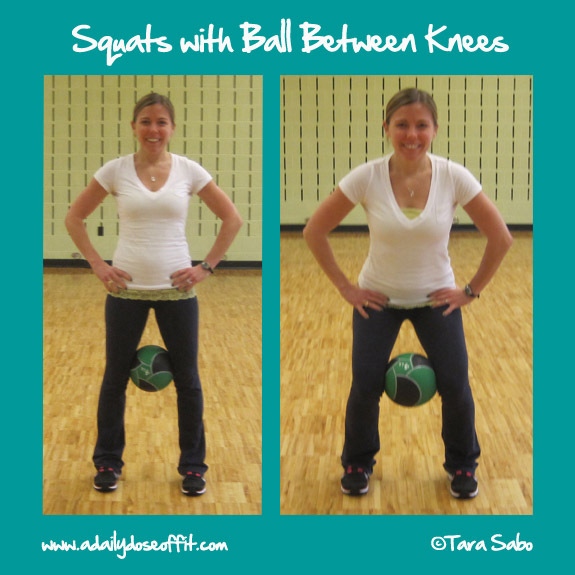 This one works your calf muscles, so grab heavy weights. Proceed to walk on your tip-toes...choose a distance that's quite long, like the short length of a basketball court. Like you're marching, with a slight jump. Right knee up is equivalent to one repetition. So, 25 per side. Find a flat band, or tie a band with handles around your calf muscles. Step to the right, then to the left. Back and forth, one repetition. It's a hip burner. Nothing fancy here. It's a pretty standard exercise. Lower the cable machine and hook up an ankle harness and step in. Kneel on a bench with the other leg, facing the cable machine. Extend the harnessed leg behind you. Cool? Great. 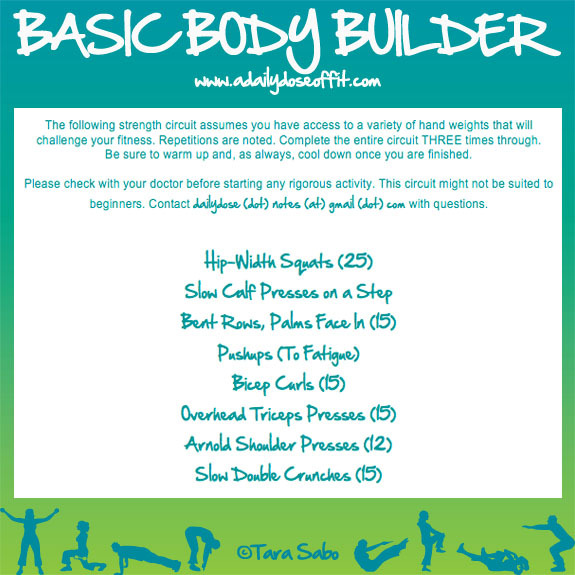 Now let's get to that upper body blitz, which assumes you've got access to some fitness equipment. If you don't, just let me know and I can offer some modifications. And please remember to proceed with the following at your own risk. Both moves should be done upright using a D-handle. Complete both chest presses, then move on to your back. OR, do both exercises on one side before moving on to the other. The choice is yours! Grab a set of hand weights, hold them at your side with your palms facing away from you. Lift up, using your chest and biceps muscles...palms ultimately face up the entire time. Hinge forward, arms at your sides and hands holding weights. With your palms facing behind you, press your arms up behind you. Keep them straight the entire time, squeezing your shoulder blades to activate your back muscles. You'll feel it in your triceps, too. Slide a body bar through the handles of a resistance band. Step on the middle of the resistance band, grabbing the bar on the outside of the band's handles. Curl, controlling the up and downward movements. In downward dog, bend your arms to bring your head closer to the ground. Push back up again. Once you finish the prescribed repetitions, walk out to plank. When it comes to exercise, revisiting the basics can be a very good thing. Not only will it refresh your memory, it will give you a benchmark on which you can test the progression of your strength and overall fitness. So that's what today's workout does—it takes you back to some basic exercises. Do it once, then do it again in a few weeks to see how far you've come. Do it to check your form, or simply because oldies are always goodies. If you're just starting out, as long as you've got the go-ahead from your doc, then doing so with the basics is both logical and obvious. Regardless, please remember to proceed at your own risk. 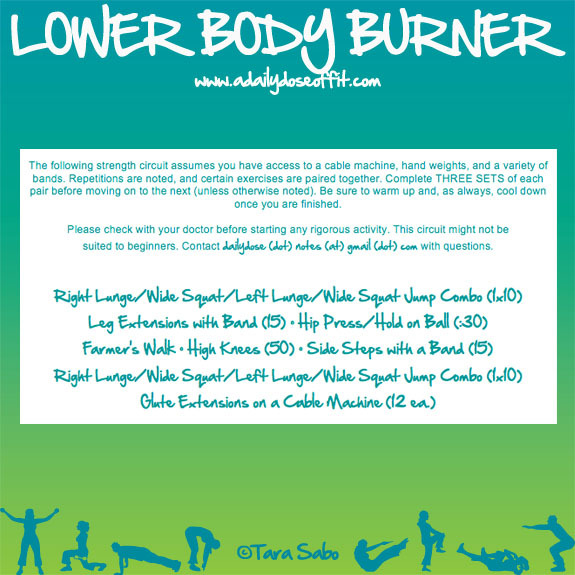 While these may seem easy, if you really take the time to press through your toes using your calf muscles, you'll find yourself at the mercy of a nice burn. Keeping your palms facing in sets you up for successful squeezing of the shoulder blades which, of course, helps to activate those back muscles even more. As always, modify to knees if you need to. Start with your palms facing in toward your chest, then press the weights up overhead as you turn your palms away from you. Return to your starting position and repeat. Much like the calf presses, the more time you take with your abdominal work, the greater the burn. I've decided to make this week the first annual Workout Week. I have not been posting very many workouts as of late, and I thought this would be a great way to get back into that. This is, after all, a health and fitness site. So let's get started with some cardio and core. What follows is a short circuit that employs high intensity interval training. It's a bit advanced, and if you're just starting out, I advise you to check with your doctor before starting any rigorous activity. If you're good to go, please do so at your own risk. Squat, and as you stand up, tuck one knee into your chest as if you were performing a standing crunch. This is one repetition. Repeat, tucking in the opposite knee. Lie on your back with your arms stretched up toward the ceiling. As you crunch up, reach up with your right hand as if you were climbing a rope. Relax and repeat using your left hand. This is one repetition. We've been playing a lot of peek-a-boo lately. I don't know if it's the surprise of seeing my face jump out of my hands or the goofy voice I use to say "peek-a-boo," but my girl seems to love it. And I love making her laugh and smile, so it's a win-win for both of us. Except maybe a bit more for me because nothing melts a momma's heart quite like her baby's laugh. Lucky for me, this isn't the only surprise situation that's come my way as of late. Sweet box, right? Another one of those monthly subscription services that delivers delicious goods right to your doorstep. 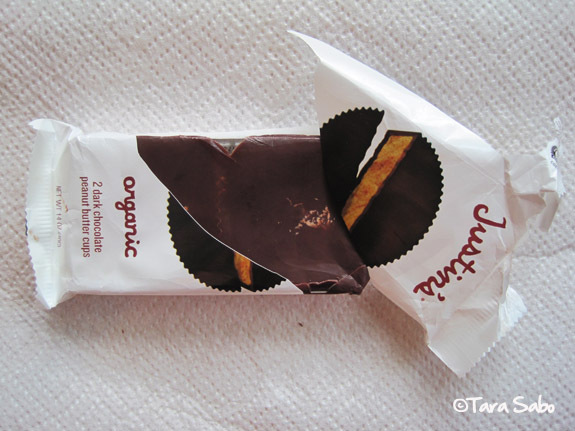 I dig delicious goods, so I am very grateful for the opportunity to experience that which is the Healthy Surprise box. 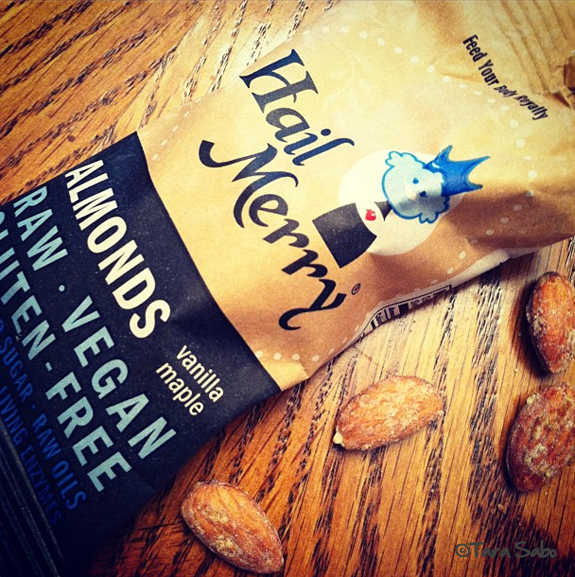 And oh—Hail Merry full of flavor! I almost shed a tear when I ate the last of the above. You think I'm joking. Believe you me, I am not. I am, however, quite possibly addicted to Instagram. And shopping, but this is nothing new. I keep hearing about Love Grown Foods granola, but I cannot buy it anywhere near where I live. I've entered countless giveaways across the Internets, sitting with crossed fingers in anticipation of wins that never come to fruition, so you can imagine my overabundance of joy when I found the above in the checkout aisle at TJ Maxx. Another healthy surprise, indeed. Do you have a TJ Maxx where you live? It's like an outlet mall, but in store form. (Seriously, your debit card is lucky if you don't have one near you.) You never know what you'll find, but yesterday, I found the above. I FOUND THE ABOVE! $3.99 a bag and I contemplated for a second just getting one bag, but snatched up all three flavors because that's what you do when you can't buy something by you...you buy it in bulk. They had a whole slew of healthy goods, but I was too distracted by my sweet score to care. I've cracked into the Sweet Cranberry Pecan and it's pretty delish. Then again, anything that combines "sweet," "cranberry," and "pecan" has to be pretty tasty, no? Anyway, that's enough about food. I've had food on the mind all weekend. Things are going well. The scale hasn't shifted, yet. Well...a pound which doesn't really count. I do, however, find myself eating even more mindfully. As in, being more aware of appropriate serving sizes. As a result, I am more in-tune with my hunger pangs and feelings of fullness which often get overshadowed by inappropriate portions. And I haven't been overindulging on the snack front, which is so easy for me to do. So here's to the next few days. We'll see what happens on the scale front, if anything. 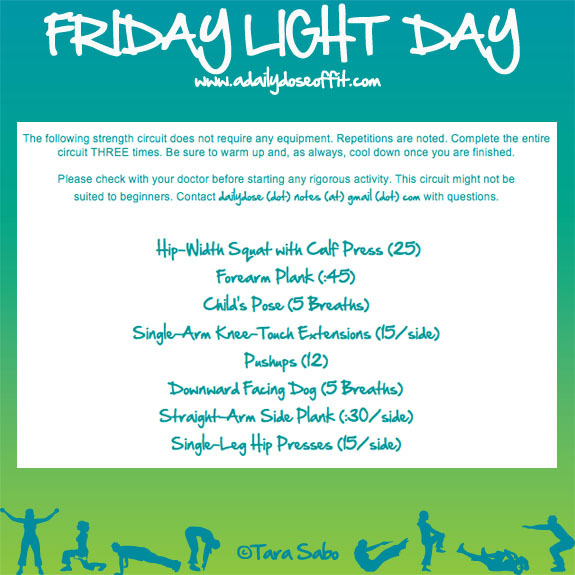 I haven't been posting many workouts lately, so I thought I'd make up for it by posting a new one each day of this week. Any requests? Today was truly a rest day. Was it yours, too? Um, so it's hot outside. What the...?! I can't even handle it. I love me some summer, but when the temps are so sweltering that you can't even sit at the beach, yeah. That's not fun. But I'm glad the sun is shining, and I'm glad my flowers are (barely) blooming. And I'm glad the sky is blue for miles. That I will always take, regardless of the temperature. Speaking of taking: How much do you take out of the peanut butter jar? Two tablespoons, or a couple of scoops? And how big was the last burger you ate? Was it three ounces of meat, as is the recommended serving size? I discovered that number while reading "Healthy Portion Sizes: You’ll Never Believe How Many Fries You're 'Supposed' to Be Eating Vs. How Many You’re Served" in the June issue of Glamour. If you're wondering, you should only be eating 10 or 11 skinny fries. Or what amounts to .75 ounces of French fry action, according to the article. The last time you ordered a side of fries, I'm betting you got more than ten or eleven. And I bet your burger was bigger than three ounces. The day I read the article, we decided to eat burgers for dinner. That's what you do on the 4th of July, right? It's the typical American meal. So I busted out my OXO food scale to make sure that we weren't patty-ing up more than our fair share. Sorry if raw meat makes you gag. ...small burgers that were still big enough to satisfy our hunger pangs. Proof that we don't need as much food as we think we do. And it's this point in the article that really hit home for me. I eat pretty good throughout the week. But if I catch myself at a super ravenous point in time, I can eat mindlessly if I'm not careful. And by mindlessly, I mean without consideration for serving size. This is especially true when it comes to carbs in box or bag, otherwise known as tortilla chips, crackers and popcorn. I always try to pick the best of the bunch when I'm shopping, but no matter how good the product is, if you eat too much of it, it's still bad for you. Boom Chicka Pop. <—Is that not the best name for popcorn ever? And it's literally popcorn, sea salt and sunflower oil. Three ingredients, all good. Serving size? Three and a half cups. According to WebMD, it's also spot-on in terms of an appropriate serving size. Sometimes you have to be careful of when it comes to packaged goods. Two servings are often combined in a single-serving package. Or a single serving of something is distorted based on the ability to sell it individually. The Glamour article lists M&Ms as an example. Specifically, a normal bag versus the fun-size bags. Both of which clock in at individual servings. In the end, I only ate one cup of the popcorn with a gigantic salad onto which I put but one tablespoon of dressing (not the recommended two as outlined on the bottle). I very easily could have eaten an entire serving...and then some, had I simply set the bag next to my plate whilst I ate my salad. And so, here I sit. Three days after reading the article. Three days of eating more mindfully, of challenging myself to be more aware of serving sizes. More so than ever. Why? What's with this serving size experiment? Pure curiosity. The author of the article claims to have lost four pounds after the end of her own experiment. She switched up her diet, and maintained her week of workouts. Four pounds, gone. Would this happen to me, too? I'm still five pounds up from my pre-baby weight. Am I working hard to shed them? Sure. Am I realistic about those five pounds...yes, as in, it's not critical that I lose them immediately because I feel great. My clothes fit. I'm healthy. But still, I'm curious. And I could use a week of eating more mindfully. Question: Is there something you eat that, well...you eat way more of than you should in terms of its serving size? I get all of these great ideas for blog posts, but I don't always get the time to write them. For example, Hannah didn't take much of a nap today, so she's currently sitting on my lap watching a YouTube video of Elmo and his ducks. Yes, we are an Elmo house these days. She can't get enough. And so while she sits happily on my lap, I've got my browser open...but not blocking Elmo...and I'm surfing Pinterest. Yep, I'm pinning. There's no way I could concentrate on anything more than that with Elmo in the foreground of my computer and a wiggly baby in my lap. So there won't be a long post from me today, just a quick quote that I found and subsequently pinned. One of my favorites, actually. From one of my favorites, too. My mother is awesome. You might think I have to say that because she gave me life, but it's true...she really is awesome. The woman is now 51 years old, but you'd never know it. People are always shocked to learn we are a mother/daughter combo. Needless to say, I got some good genes. (Don't worry, Dad. I love what I got from you, too.) But it's not just her looks that make her awesome, it's the love she shares. Her heart is bigger than big. Family means so much to her and it's something she's instilled in me, which I cannot thank her enough for. Especially now that I'm building my own family. She's a good Grammy, my mom is. She's also a good mom, even though I'm all grown up. 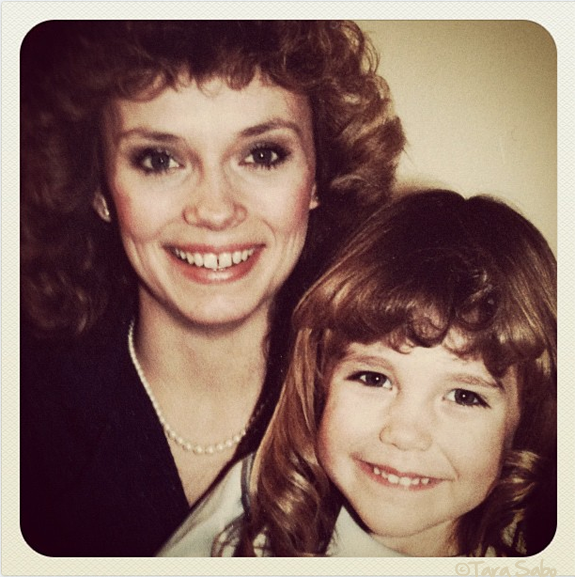 Although, let's be honest, do we ever stop needing our moms just because we become one ourselves? No. We need them more than ever as we get older. And I am glad that she is mine. There's not a thing I can't turn to her for, not a thing she wouldn't do for me. For that, I am blessed. I am blessed to have learned from the best. My mother is awesome, not just because she's my mom. The lady is super fit. More fit than she's ever been, I think. She never used to be a runner, but now...just try and stop her. 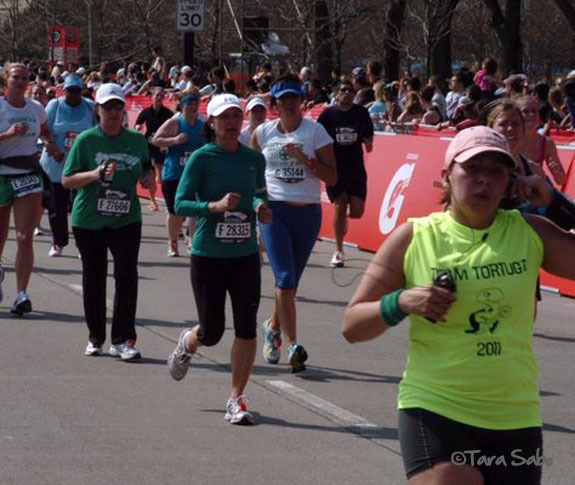 F28315, you rock the finish line. Don't ever let yourself think otherwise! 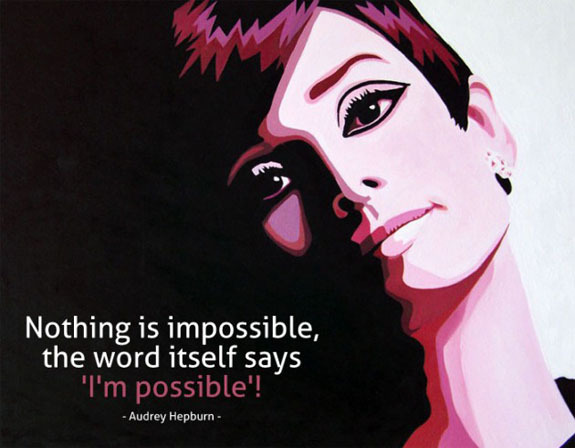 You can do it, you can always do it. Even when you feel like giving up. Case and point: Third place finish in your age group at the Hartford run. For a bad run, it sure did end on a good note. Any race I (we) run with you usually does. 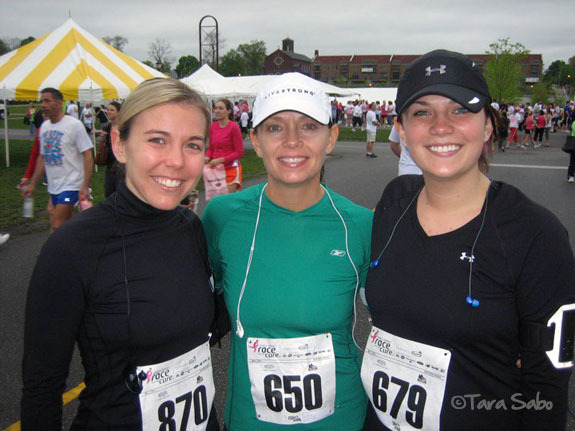 I love that the three of us, mother and daughters, can all run together. Such a great thing to share, and I can only hope to share that same experience with Hannah...who knows, maybe we'll get three generations to pound pavement together one day. There's no doubt in my mind that you'll be one of those cute old lady runners. The ones that move, albeit a bit slower than others, toward the finish line in their matching outfits. The ones you look at and think, "I hope that's me someday." That's totally going to be you and I'll be so proud. Teething child...or perhaps this stroller belonged to a child of the furry kind. As in, a werewolf or something. Seriously, what gives with the gnawed on straps...I'll never know. Or understand. Is this not why they make chew toys? Anyway. They can be replaced. And will be. But have no fear, pink duct tape is here. You think I'm kidding, but alas—I am not. It saved the day...or the spray, however you want to look at it. I was able to hose the stroller down, scrub it good with the soap, re-hose it down and call it good. I took a towel to it, mostly just the metal parts, but ultimately left it in the sun to dry. I think I need to learn a little bit more about the breaks. It rolled across the street as I was cleaning up my mess. Whoops! Good thing Hannah wasn't in it. Question: Do you run with a stroller? Does it change the way you run? How old was your child before you started using your running stroller?